Why are we nuts about the Nusas? Because they’re easy like a Sunday morning! Over the past few years this tropical trio has fallen under the backpacker’s radar, probably thanks to a string of social media appearances. 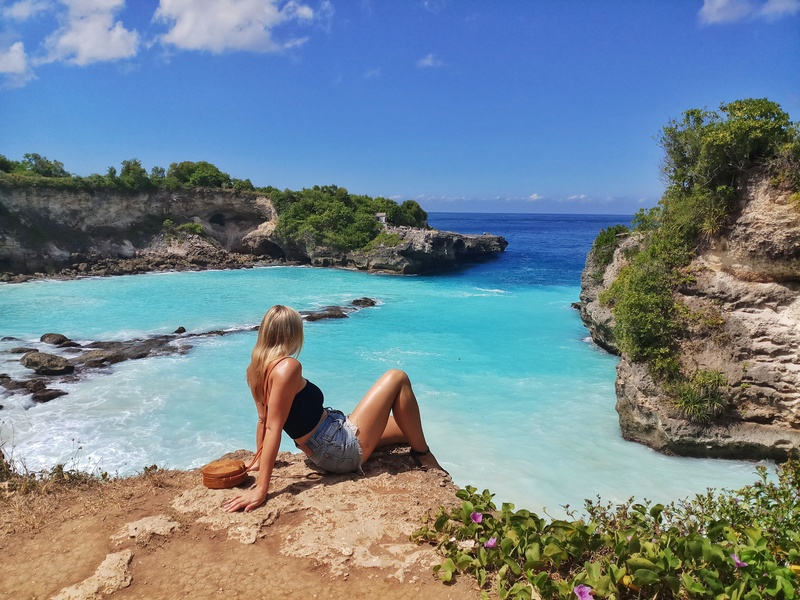 Much like the nearby Gilis, travellers are drawn to these Indonesian islands for their idyllic beaches and vibrant marine life, but its their dramatic coastal landscapes and untouched beauty spots that really define them. If you’re looking for a truly laid-back, unadulterated flavour of Indonesia, than the Nusas are your jam and toast. Glad you asked . The Nusa Islands are a short 25 minute boat ride from the east coast of southern Bali. They’re made up of Nusa Lembongan, Nusa Ceningan, and the largest Nusa Penida. 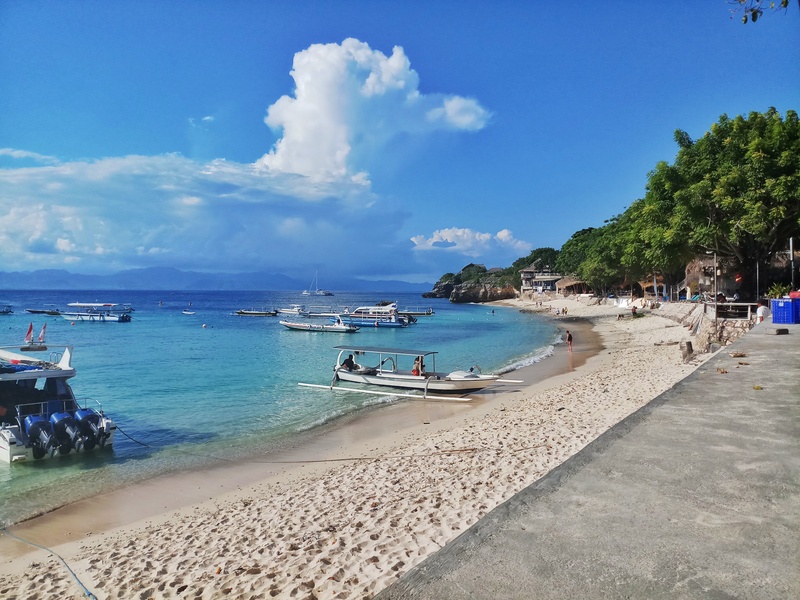 Considering they’re so easy to get to, the islands are far less visited by backpackers and tourists compared to their smaller neighbours the Gilis. Despite being quiet, they are far from boring! Find out the best ways of getting to the Nusa Islands here. What can you do on them? The question should really be what can’t you do! 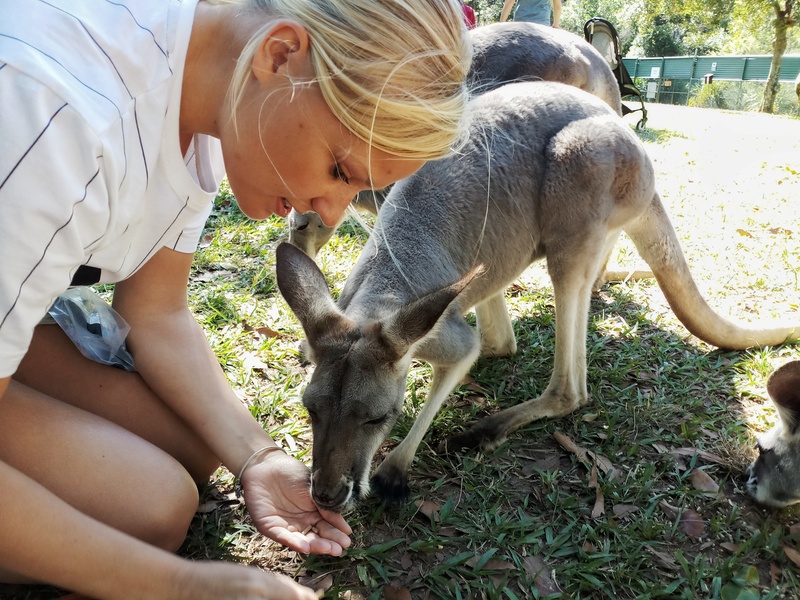 There are activities and excursions to suit everyone’s taste. 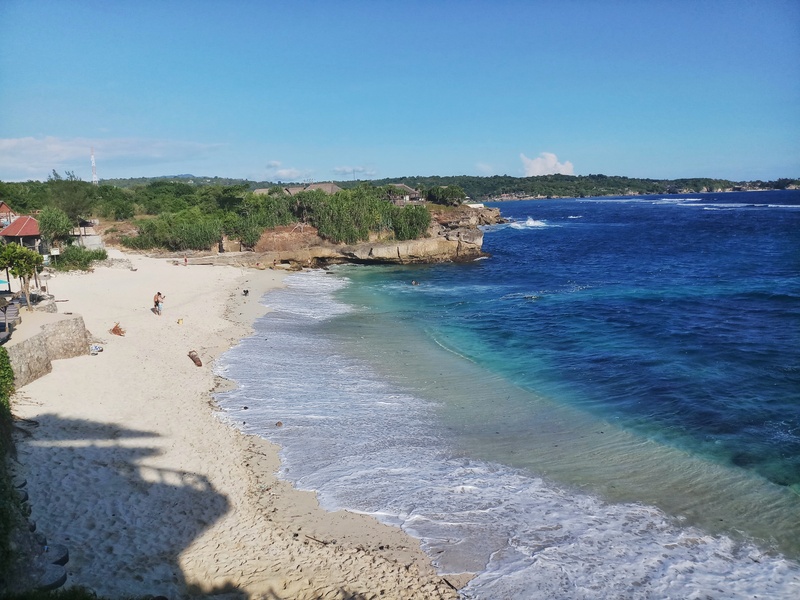 The busiest of the islands is Nusa Lembongan, as it acts as a gateway to the other two and has a good number of shops, restaurants, beaches, cafes and hotels all a short drive from each other. 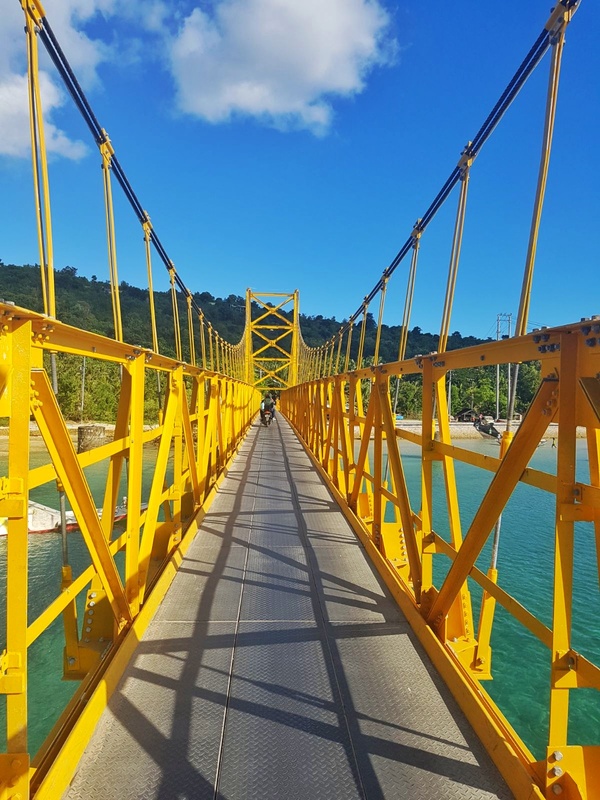 It’s also conveniently connected to Nusa Ceningan, the smallest of the three, by a yellow bridge. This means you can easily explore both islands by foot, bike or motorcycle. Some of the most popular activities include snorkelling, diving, surfing, fishing and trekking. For a good day excursion, hire a boat for around 250,000-300,000 rp per person (£15), and explore the colourful reefs surrounding Nusa Penida. 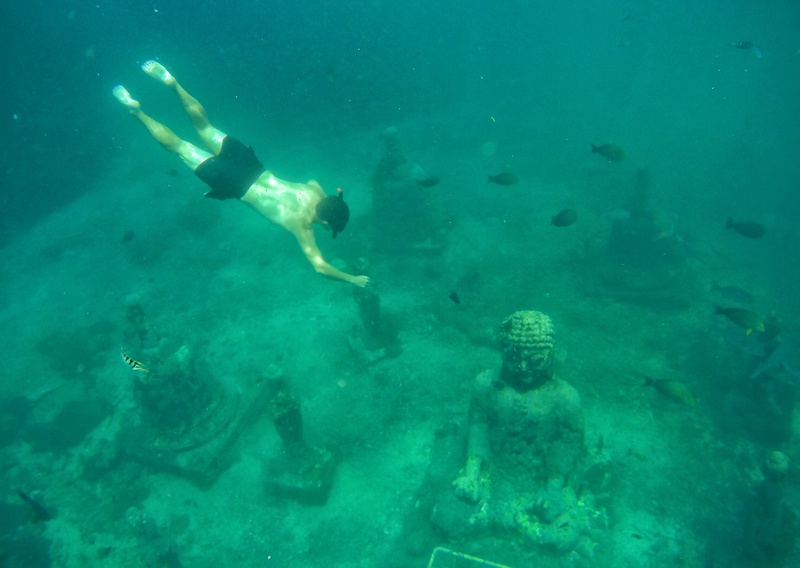 We saw too many types of fish to name and even visited an underwater Budda at Temple Point. The real star of the sea show though was the Manta Rays. There are vast numbers of these gentle giants gliding through the waters off the coast of Penida. Your guide will likely take you to Manta Point first, along with dozens of other boats. 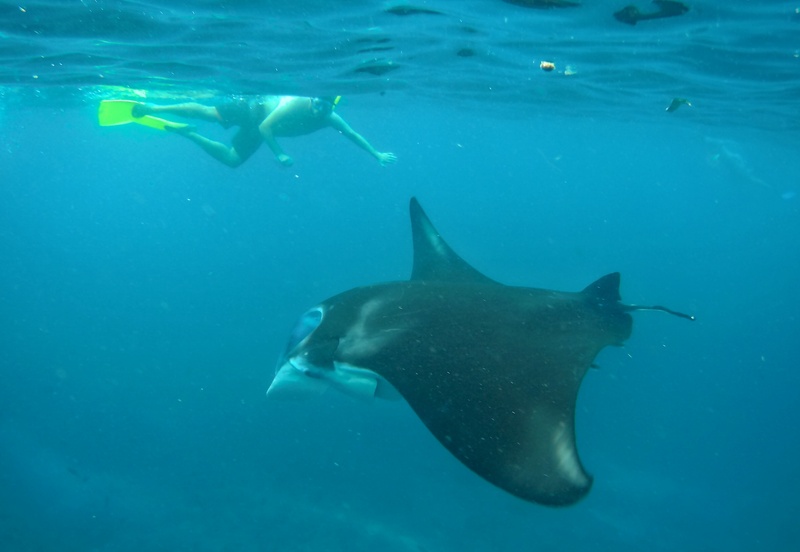 You can also dive with the Manta Rays, but it’ll cost you more. My favourite thing we did on the islands was hire a motorcycle and visit all the natural wonders. Our first stop was the Blue Lagoon on Nusa Ceningan. The colour of the water was blindingly beautiful. It’s free to park up and walk around the edge. 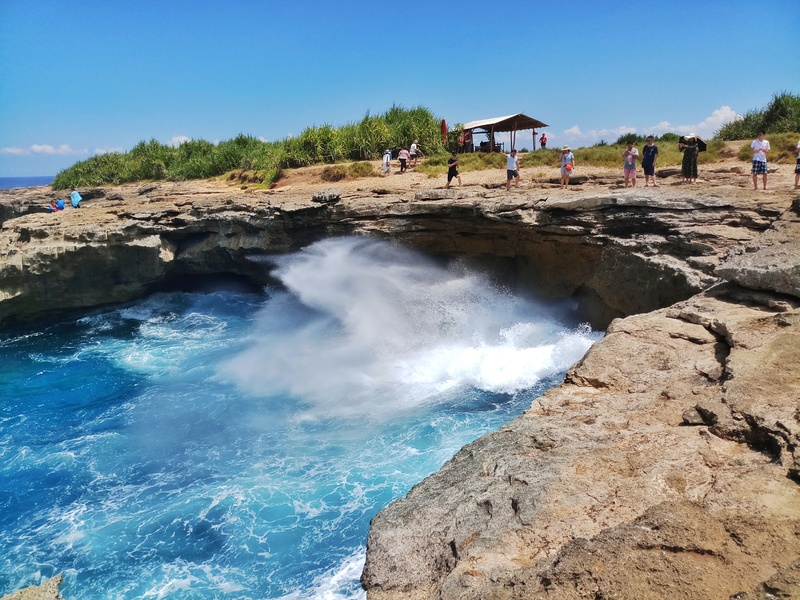 The next stop was the Devil’s Tear on Nusa Lembongan, which was Joe’s personal favourite. You can stand in awe as the waves are sucked into the crevices of the rock and spat back out ferociously, almost like the coast is crying! 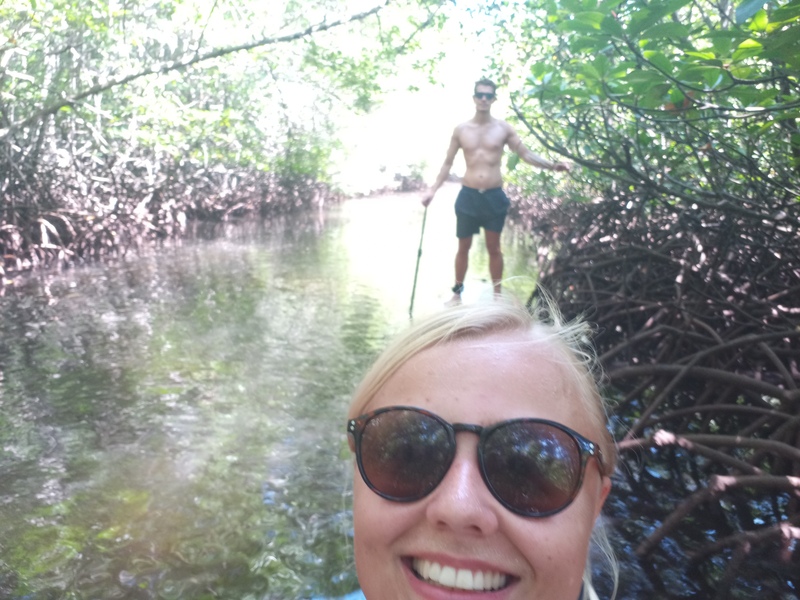 Another unusual activity is paddle boarding through the Mangrove Forest on the north of Nusa Lembongan. It cost us 100,000 rp (£5) to hire a board for an hour from a cafe just by the entrance to the forest. It’s hard to navigate with boats passing often, but it’s a good laugh. 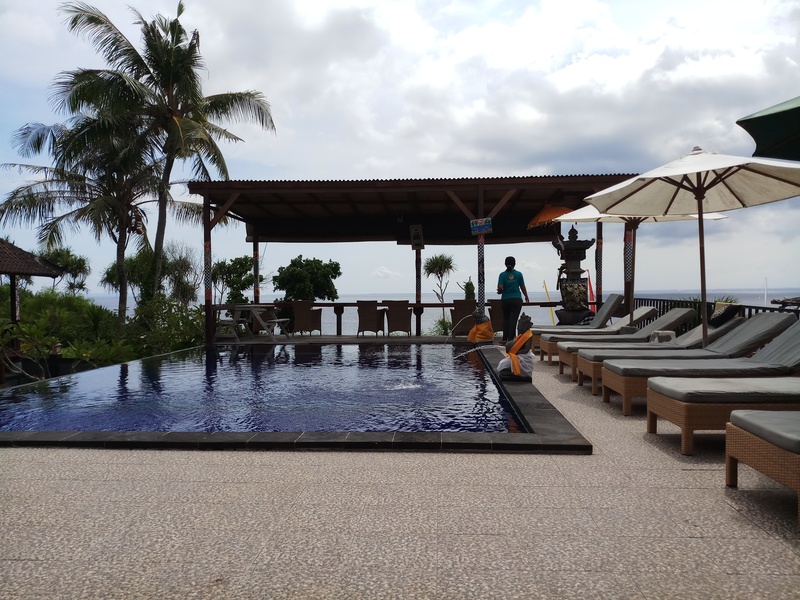 Other fun things to do is yoga, learn to free dive, lounge at Sandy Beach Club, enjoy a massage by the sea, cycle around Nusa Lembongan, and fly through the air on the Abyss Zipline on Nusa Ceningan. A popular excursion is taking a one or two-day trip to Nusa Penida. You can jump on a boat to the island for 60,000 rp (£2.50) by the Yellow Bridge on Nusa Lembongan. When you arrive at the beach, you can either hire a boat or a private driver. The roads aren’t the best and difficult to navigate around, so unless you have a license or good experience riding a motorcycle, I wouldn’t recommend it. 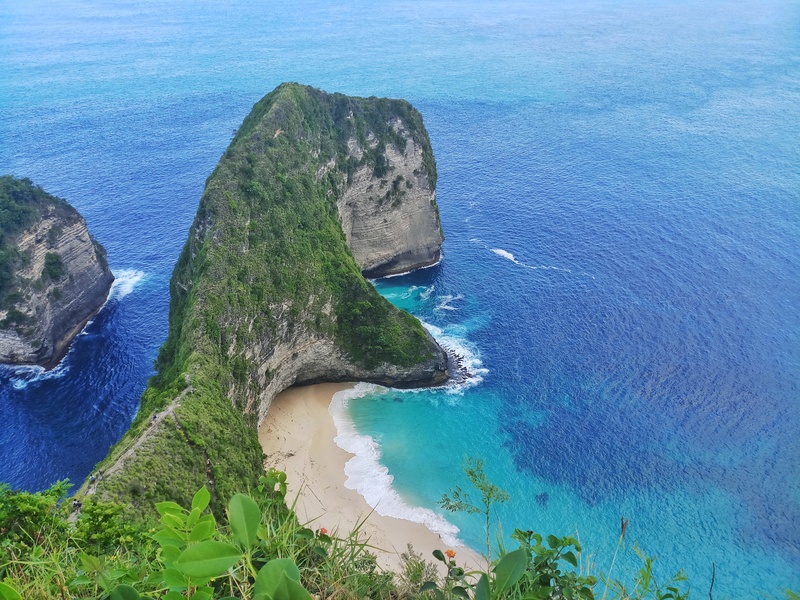 Click here to read a detailed guide to exploring Nusa Penida. You’re spoilt for choice when it comes to beaches on the islands. 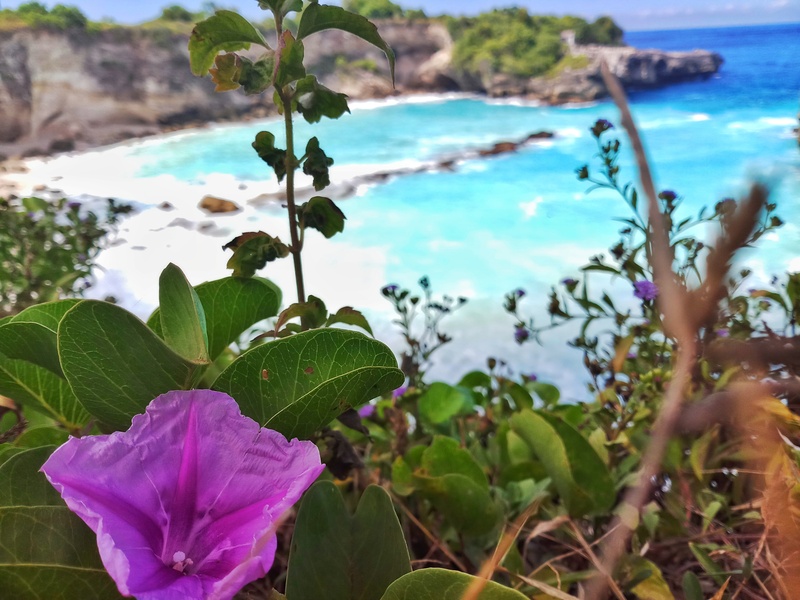 The main two in Nusa Lembongan are Dream Beach and Mushroom Beach. They’re not that far from one another by car or motorcycle and they both have great spots to chill out and enjoy the sound of the waves crashing against the shore. 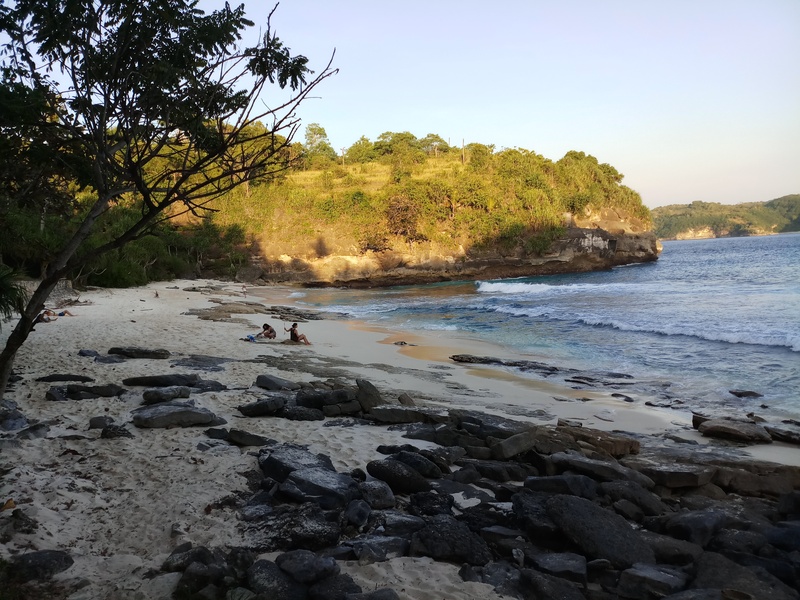 On Nusa Ceningan, it would be worth your time seeking out Secret Beach on the east side of the island. It’s a private stretch of sand attached to a resort, but you can enjoy it too if you buy something from the cafe or restaurant (minimum spend was 35,000 rp when we were there). It’s not really safe to swim though, as the current’s very strong. 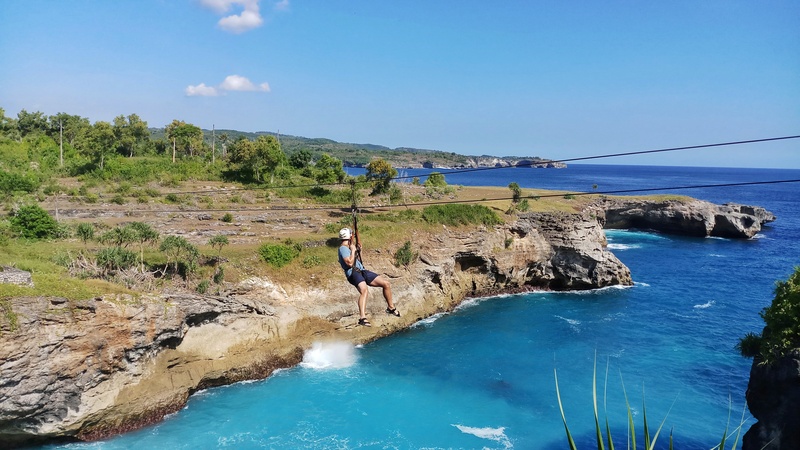 If you’re the adventurous type, then exploring the white sand beaches of Nusa Penida will be well worth your time. Crystal Bay is the closest to the harbour, but on the eastern coast there are some true gems, including Atuh Beach, where you can stay in a Tarzan-esque treehouse with an exceptional view, Suwehan Beach, and finally in the south Banah Beach. 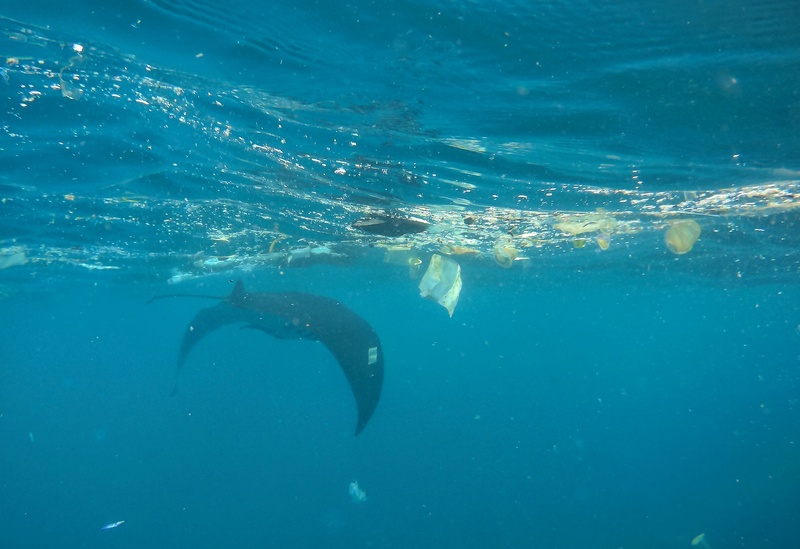 On a serious note, it’s important to mention the worrying rubbish situation at Manta Point. While swimming with these beautiful creatures, we were shocked to see dozens, if not hundreds of pieces of plastic floating around us. Just last month footage taken by divers made international headlines. 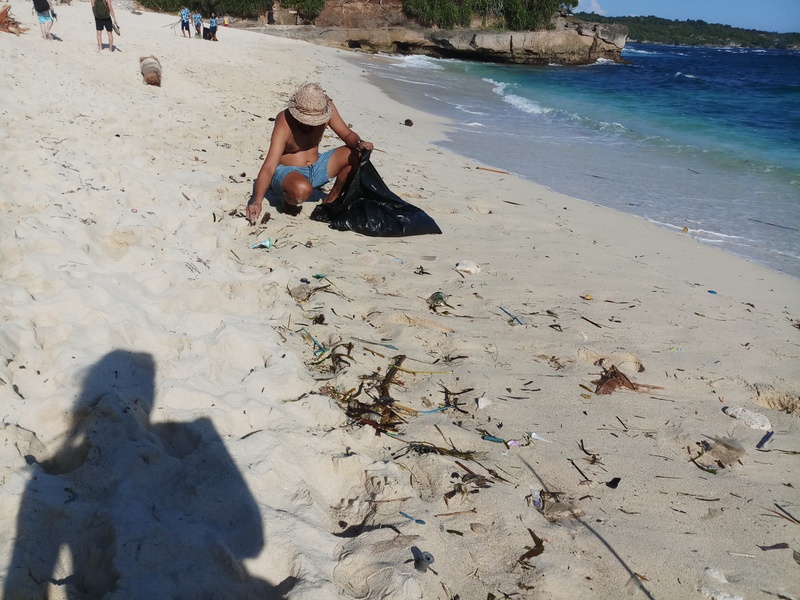 The area sits within a current called the Indonesian Throughflow, which means local rubbish and waste from as far away as the Pacific Ocean ends up there. The Government has begun a large sea clean-up operation, but as a responsible traveller please recycle where you can, pick-up anything you find on the coast that should be binned, and try to use as little plastic as possible. 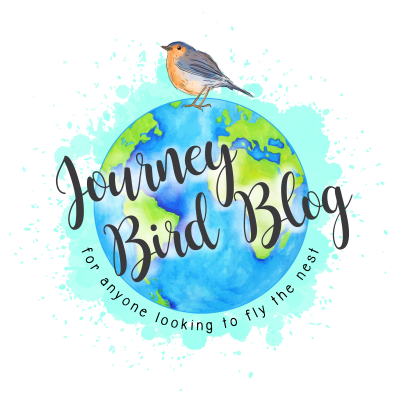 We stayed in a few different accommodations on the islands, ranging in price but all great choices. 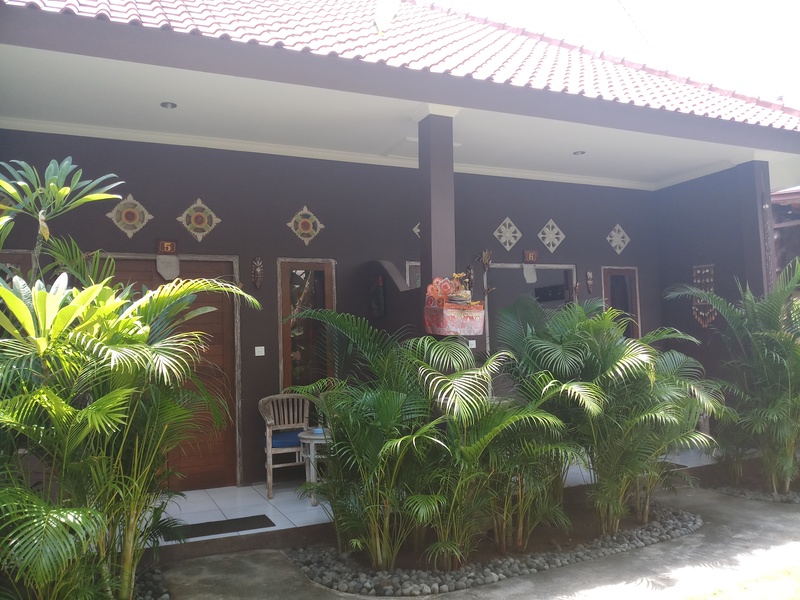 If you want a good location to explore both Nusa Lembongan and Ceningan, then the Yellow Bridge Guesthouse is perfect. It’s right by, you guessed it, the Yellow Bridge, so both islands are at your fingertips. They’re also good for a backpacker’s budget, with a double private villa costing £14 a night, brekkie included! If you want a more romantic setting try the Ocean Sunset Villas on Nusa Ceningan. For £22 a night, you can wake up to a beautiful view of the sea and have breakfast on your private bungalow’s terrace. It also has a great pool to cool off in after a long day exploring. 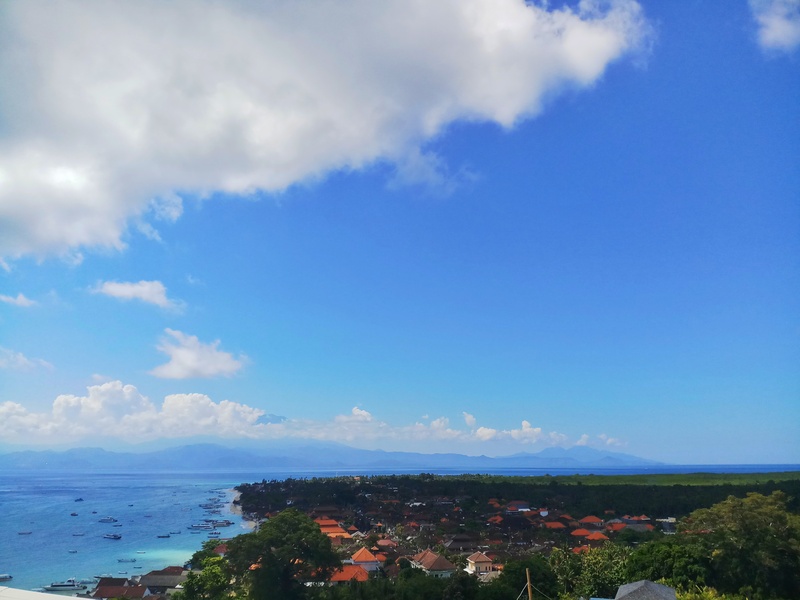 Another option is to stay in one of the two main villages on Nusa Lembongan, which are Jungut Batu on the west coast and Lembongan Village further south. 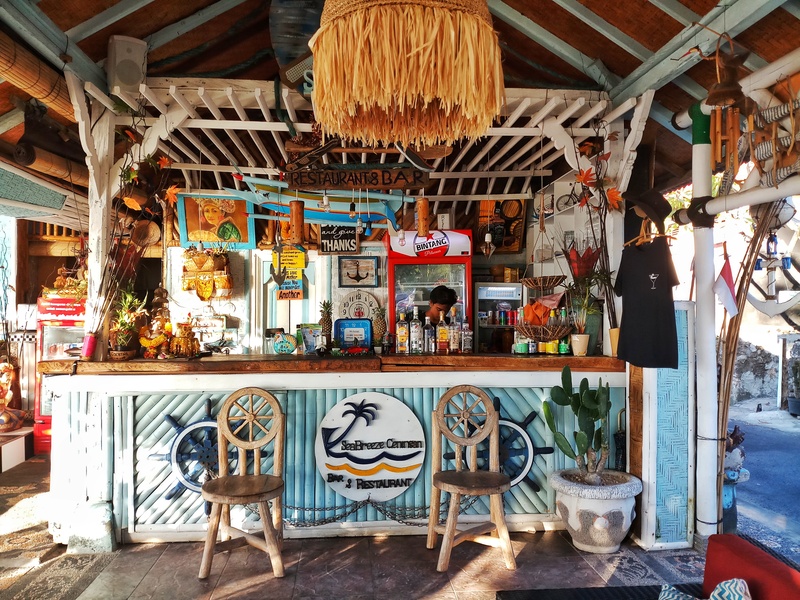 Both have a good number of restaurants and beach spots so the choice is yours! 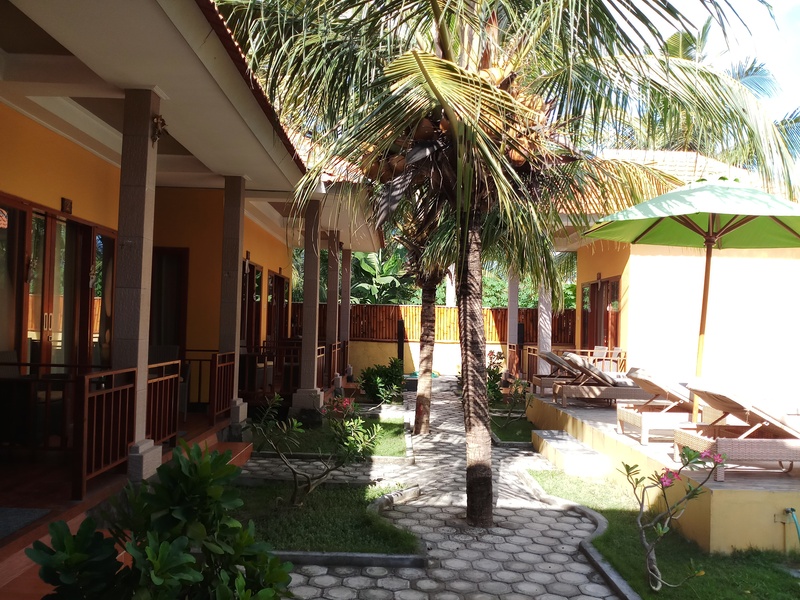 We stayed at Naturale Guesthouse on our last night before catching a boat back to Bali. It was just £9 a night, breakfast included. As we were on Lembongan and Ceningan we got to try out a good number of restaurants and bars. We found Ceningan was cheaper, as the prices included the 10% service tax. We enjoyed watching the sunset having dinner at Sea Breeze Warung restaurant and the Next Level cafe. On Lembongan, stop off at the Bali Eco Deli for a delicious and healthy meal. We also liked Green Garden Warung where you can take part in a yoga class before sitting down for lunch or dinner. 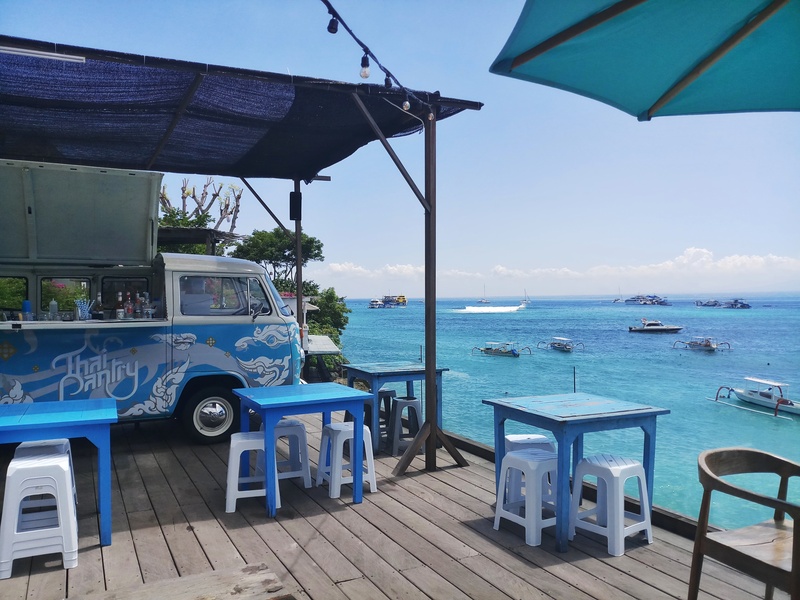 A great restaurant with a spectacular view of the Lembongan Harbour is Thai Pantry. It’s right next to a place called The Deck, which is perfect for having a cocktail and watching the sunset. Read our guide on Nusa Penida to find out where to eat there. Can you get cash out on the islands? There are a couple of cash points on Nusa Lembongan dotted around the two main villages. We used the BNI bank (Bank Negara Indonesia), as it allowed us to withdraw quite a bit more than the others. There is also one on Nusa Penida just as you come off the boat at Toyapakeh Harbour. There are no cash points on Nusa Ceningan though, so you’ll have to make the journey across the Yellow Bridge if you’re running low. Most hotels will charge 3% for card transactions so bear this in mind. 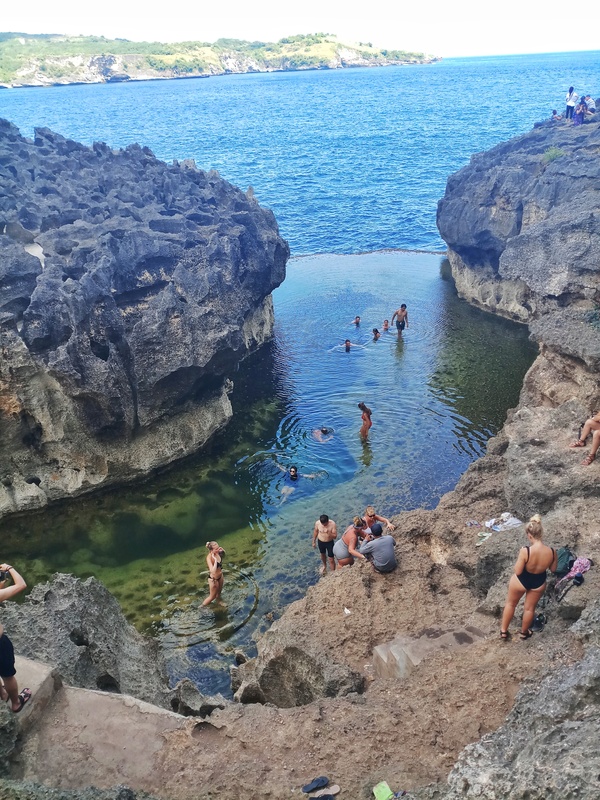 Click here to see our favourite photos from our time on the Nusa Islands.